Ok, so “fashionable” probably isn’t what comes to mind when you think of office products, but why not? You spend time getting ready for work, and wanting to look your best, so why not do the same with your office products? Sound crazy? Maybe not. Many manufacturers are taking notice that women make up 47% of the workforce (according to the Department of Labor website), and that they are the ones using their products. 1. What woman doesn’t like shoes? 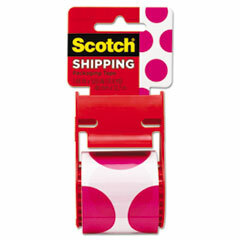 With the Scotch Stiletto tape dispenser you can really step up your style! Choose your favorite color and accessorize your desk. Or, for true fashionistas, get all three and pick the one that best matches your outfit each day. 2. 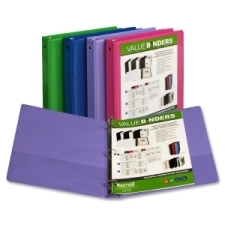 Add a pop of color to your files by using the Samsill 185 Value Insertable Fashion I View Binder. Not only do these binders come in great colors, but they also offer a clear overlay so you can customize the front, back and spine by inserting your own cover. And they are made with 40% post –consumer materials so you can be fashion conscience and environmentally conscience all at the same time. Talk about a good look! 3. Believe it or not, we can even make note taking more fashionable! Tops Steno books with fashion covers brighten up any workspace! 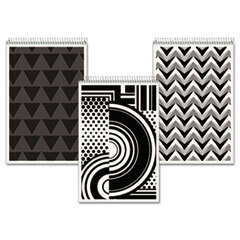 The covers come in interesting black and white graphical designs (a hot fashion trend right now) to get your creativity flowing! And fear not – these are usable by both right and left handed writers. 4. 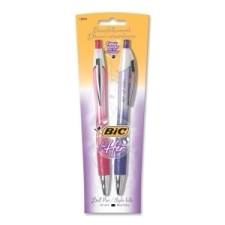 And to step it up a little more, use the BIC for Her Fashion Ballpoint Pen. This pen’s sleek design and jewel-tone accents add style to any project. And to make it even better, the pens are refillable for continued use. The perfect pen for any professional woman. 5. Want to express your style to even those you don’t see face to face? With Scotch’s new line of decorative fashion shipping tapes, now you can. Brighten up your cardboard boxes with 1 of 4 great patterns, and show the world your style! 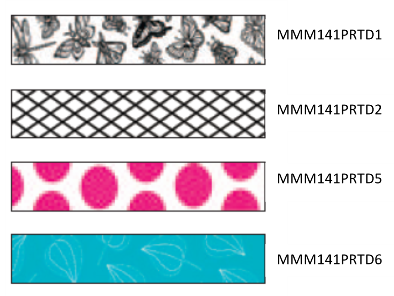 My favorite is MMM141PRTD5 because I can’t help but smile when I see polka dots. These tapes come with the same strength and durability that you expect from scotch, and come on a reusable dispenser.